Singer Paula Abdul, Alex Newell (Glee) and The Young Americans will perform at the 30th annual AIDS Walk Los Angeles on Sunday. The entertainment stage will be in West Hollywood Park, where the expected crowd of some 25,000 will gather at the beginning and end of the 6.2-mile walk. The route includes checkpoints with water and snacks, also ends in the park. 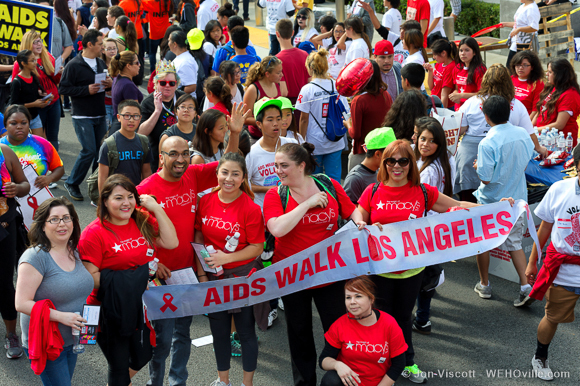 Last year’s AIDS Walk raised more than $2.5 million for AIDS Project Los Angeles (APLA) and other HIV/AIDS service organizations. In addition to those walking to support HIV/AIDS services, the 2013 AIDS Walk drew some anti-LGBT protestors. 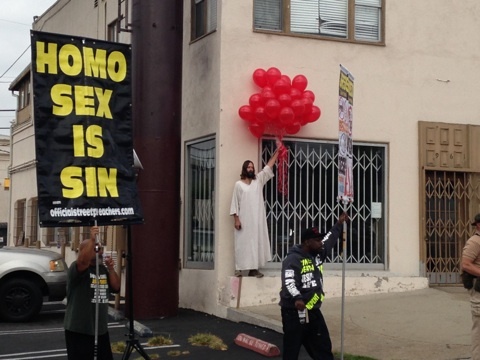 Countering them was the peaceful presence of “WeHo Jesus,” aka Kevin Lee Light. A longtime Jesus impersonator, Light is often spotted around WeHo. Those interested in participating can register online. San Vicente Boulevard from Santa Monica Boulevard to Melrose Avenue from 6 a.m. on Saturday to 6 p.m. on Sunday. San Vicente Boulevard from Beverly Boulevard to Melrose Avenue (east side only) from 6 a.m. to 3 p.m. on Sunday. Robertson Boulevard from Melrose Avenue to Santa Monica Boulevard from 6 a.m. to 12:30 p.m. on Sunday. La Peer Drive from Melrose Avenue to Santa Monica Boulevard from 6 a.m. to noon on Sunday. Santa Monica Boulevard from Doheny Drive to Holloway Drive from 6 a.m. to noon on Sunday. La Cienega Boulevard from Santa Monica Boulevard to Melrose Avenue from 6 a.m. to noon on Sunday. Melrose Place from La Cienega Boulevard to Orlando Avenue from 6 a.m. to noon on Sunday. Melrose Avenue from San Vicente Boulevard to La Brea Avenue from 6 a.m. to 1 p.m. on Sunday. La Brea Avenue from Melrose Avenue to Beverly Boulevard from 7 a.m. to 2 p.m. on Sunday. Beverly Boulevard from La Brea Avenue to San Vicente Boulevard from 7 a.m. to 2 p.m. on Sunday. ← APLA Expands Medical Services, Offers Primary Care in South L.A. If the anti-LGBTQ christian hate groups are so entitled as to disrupt our events, we should disrupt christian events that promote homophobia, patriarchy, anti-choice, racism and, their wars for israel. See how much they like it. Many right-wing christians are big time gun nuts who think they are entitled to open carry and threaten people. In the past when threatened by a few of these losers, I obtained a restraining order that mandates that they have to give up all their guns to be destroyed by law enforcement. Now I’m not messed with and, will be keeping a close eye on the jesus freaks during the AIDS Walk! You won’t be alone on this one Emilija! If the right wing hate groups come looking for trouble in Weho , let’s give it to them, see how tough they are in our jail when Bubba wants to “get to know them better”!